From a seated position open the legs out diagonally. Twist the upper body and lean forward and down as far as possible towards one leg. Place the hands on the leg or if the legs and lower back are flexible grab the foot. Point the toes, heels or ball points of the toes. Try to get the belly and chest to touch the leg. Then stretch through your head and lengthen the spine. You can also look forward in this pose. Push the back of the knees down to straighten the legs more when you are down. Lengthen the spine and chest along the extended leg. Over time this will extend the abdominal area and allow more space for breathing. The leg that your extending away from has a tendency to turn inward. You may allow this or rotate it outwards so that the knee faces upwards perfectly. The positioning and rotation of the leg affects the adductor muscles many of which are large muscles attaching to the pelvis and inner part of the femur bone. 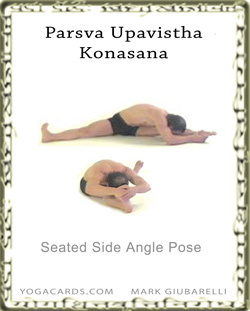 This can be a nice alternative to Janu Sirsasana is someone has a knee injury. When looking for alternatives choose postures that are similar and have similar effects. Some postures will just aggravate a condition that afflicts a student. Modify it or choose a different option so that a positive response is felt during and after practice.